Film noir is an interesting Lent conversation, because it’s notable for exposing the darkness lurking in the human soul. In film noir, the “bad guy” isn’t some un-relatable outsider. In film noir, the “bad guy” is the person who lives next door. It’s the insurance salesman…the housewife…the English teacher. It’s you and me. That’s what film noir does - it brings evil home to rest. It’s not “out there”…it’s so much closer than you would ever imagine. How interesting that film noir became an emerging box office sensation in America during the prosperous and lucrative postwar years? 1950’s America promised more than just economic stability after so many shaky years…it promised happiness. Isn’t this what every dominant culture tries to promise its people…happiness? Which begets the question, can a culture ever really deliver upon this lofty promise? The number one box office film genre of the 50’s was the American Musical. Jovial stories which reinforce the promise of the dominant culture - happiness is within your grasp! Everything works out in the end! The American musical promoted the emerging “American Dream” - you can have it all! Good times are ahead. Not far behind the musical at the box office is this strange new genre we call today, Film Noir. As noted above, evil is also within your grasp, whether you realize it or not. Noir were often extremely low budget affairs, produced on a shoestring. Typical of prophetic voices, Noir came from the margins…proclaiming with a subtle (and sometimes not so subtle) voice, “the human heart cannot be fixed so easily. All the picket fences in the world won’t fix the condition of the human soul”. 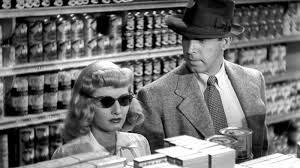 How ironic that Film Noir emerges in the one decade it “shouldn’t” have emerged? The 1950’s - when everything is (supposedly) bliss. Rationally, it would make much more sense for the Noir film to emerge in the 30’s, when America is reeling from the Great Depression. Why doesn’t it emerge then? Because the dominant culture isn’t able to fool people into thinking happiness is something that every house can obtain simply through living a good life. People in the 30’s know life is hard. Skrewball comedies dominate the box office - overt escapism. Prophets tend to emerge when they’re needed. They’re mostly needed when we’re susceptible to deceit. When conditions are such that we can be fooled. When truth is a rare commodity. Film Noir as a prophetic voice.